The local style blogger talks travel, podcasts, and espadrilles for spring. There aren't very many men in Seattle who are doing menswear blogs, so it's like Is this not a thing? Or should I create it and see what happens? I just heard this quote, "One must have the belief that anything is possible, you have to be mad to the point of being irresponsible." When you do things that are creative or artistic, you don't know if people are going to get it. Just believing in yourself is the biggest battle. I've always been interested by menswear and fashion. I like to base my style off a timeless, classic suiting look, and then bring in unexpected vintage pieces. I draw inspiration from David Beckham, his style is always impeccable, but also James Dean and Paul Newman, guys who were always looking effortlessly stylish. I recently took a trip to Southeast Asia with my girlfriend in November, and we traveled to Cambodia and Thailand. When you travel to places like that, you definitely can't be suited up. It's more linen pants or light-weight shirts or sandals instead of dress shoes—and I've never really been a sandal person. So for spring and summer, espadrilles are really big for me; they can be either dressy or casual. In the past two or three years, we've had a huge influx of people from all over the world, who are here because of different opportunities. And so you get people bringing in style from wherever they're from, whether it's New York or LA or Europe. Now, guys who are from here are starting to step their style game up. It's fun to see the landscape to start to move in that direction. Seattle's still very casual but you're starting to see a change in details. 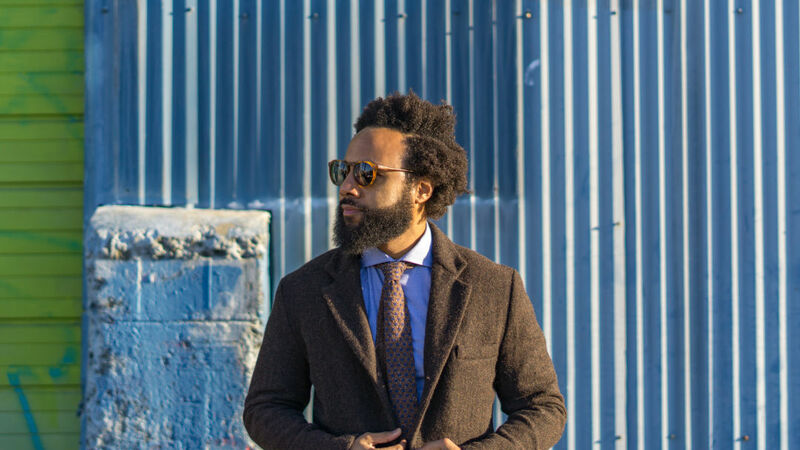 Put down the puffy coat in the winter time and change it for a top coat or a peacoat. I'm a podcast guy 100 percent. I keep an ear piece in all day just listening to different podcasts, like Music Exploder, an artist will sit down for about 30 minutes and talk about that specific song. There's also a podcast called The Art of Manliness, which is just good advice about how to be a man or human being in general. I usually go to Caffe Umbria for coffee and just sit on the patio and people watch. I live down in Pioneer Square and in the spring and summer you've got the tourists down there, they kind of take over and you can see people from all over the world. Favorite shops... Filson, Suitsupply, Jack Straw in Belltown has really cool menswear from Europe and Japan, stuff you can't get at Nordstrom or other mainstream places. Beckett and Robb does bespoke, tailored styles; they've been around for a few years but have a store now in Seattle.